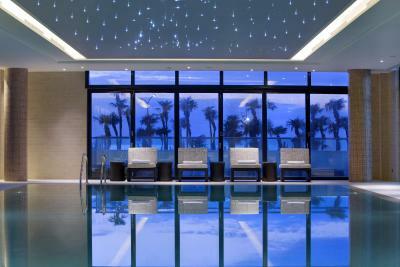 Lock in a great price for Hilton Batumi – rated 8.2 by recent guests! Had to pay extra for the Sea view but it was worth it. Comfortable bed and very clean ambience. clean, nice hotel. 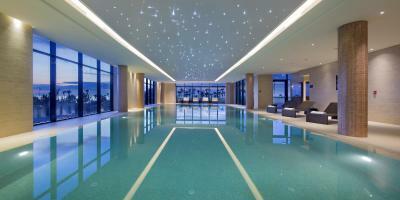 great spa and a clean swimming pool. 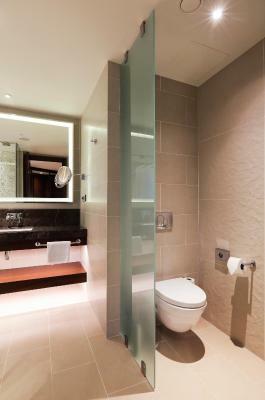 very good, spacious and well set bathroom in the room. nice staff. - The location is amazing and the room view was breathtaking. 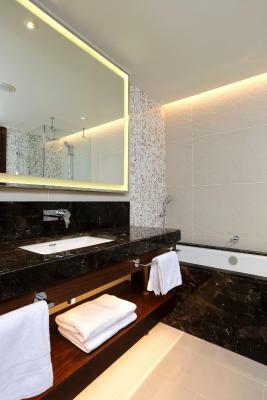 - the toilets are spacious and the shower is great. The bed was very good! When I complained that the AC was not up to par, the staff did their best to accommodate. Very nice location. Friendly reception staff. 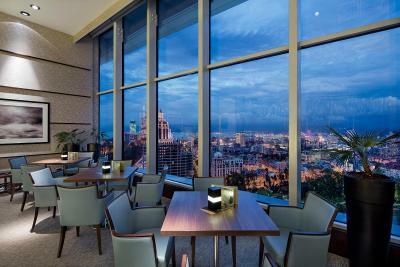 Amazing restaurant SkyBar Nephele on the 20th floor with a great view and amazing food (best food in Batumi). Great rooms with great views. Nice gym. The facilities are very good but doesn't compensate on the unhelpful staff. The room was excellent! The view from the room was amazing! I love everything in this hotel. Staff was so helpful. Hilton Batumi This rating is a reflection of how the property compares to the industry standard when it comes to price, facilities and services available. It's based on a self-evaluation by the property. Use this rating to help choose your stay! 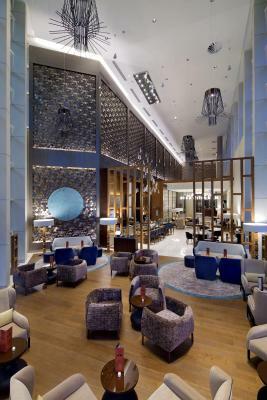 One of our top picks in Batumi.Located in the center of Batumi, just 650 feet from the Black Sea coast, Hilton Batumi is a pet-friendly 5-star hotel offering a modern interior design and high-quality facilities. 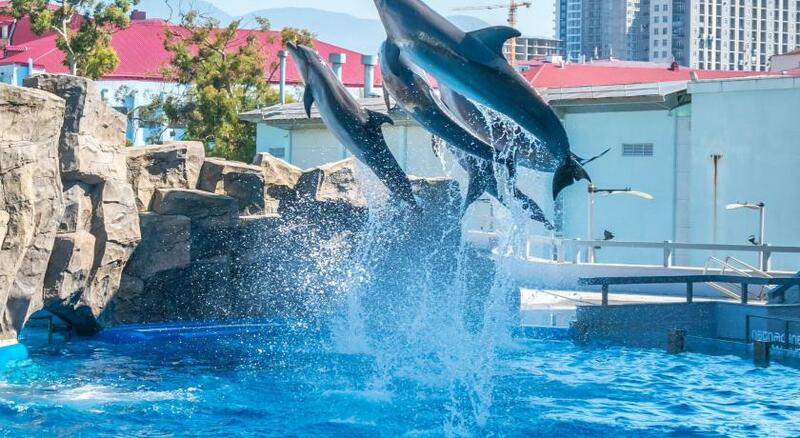 Dolphinarium is 1,000 feet from the hotel and Europe Square is 2,950 feet away. 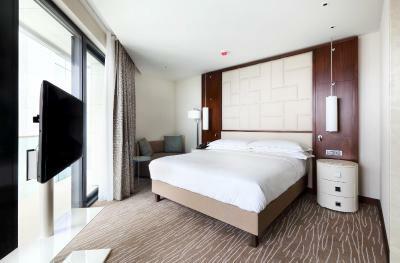 Each modern room here is air-conditioned and carpeted and features a flat-screen TV with satellite channels. A mini-bar and an electric kettle are at guests' disposal. Featuring a shower or a bath, private bathrooms in each unit come with free toiletries as well as a hairdryer, linen and towels. Extras include a desk, a safety deposit box and a laptop safe. 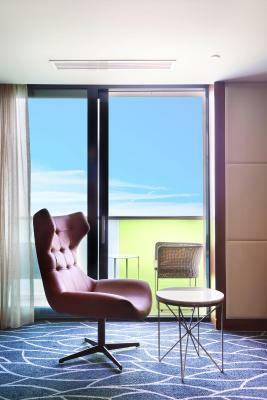 Certain rooms have a balcony offering a lake, mountain or a sea view. Interconnected rooms, convenient for families and not only, are also available on site. 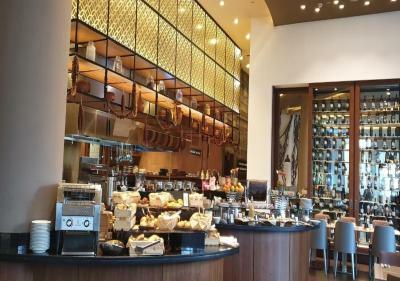 The hotel offers certain rooms with access to the Executive Lounge, which serves a delicious buffet breakfast, refreshments throughout the day and evening canapés. 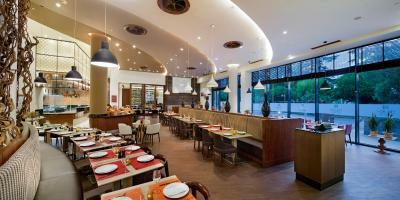 At Hilton Batumi guests can enjoy À la carte restaurant serving local and European cuisine. 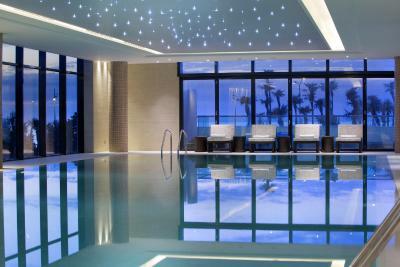 Sauna, steam rooms and fitness as well as spa and wellness center and a swimming pool will be at guests' disposal. 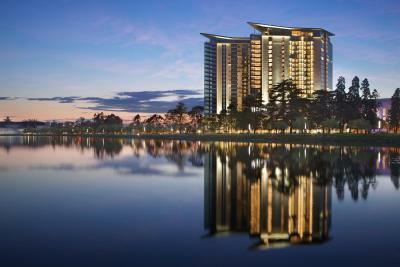 Shared areas such as casino, sun terrace and designated playground for children are available. 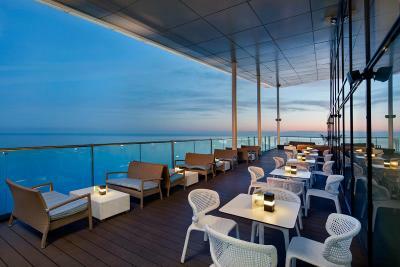 Hilton Batumi also provides guests with complimentary sun loungers, umbrellas and beach towels. 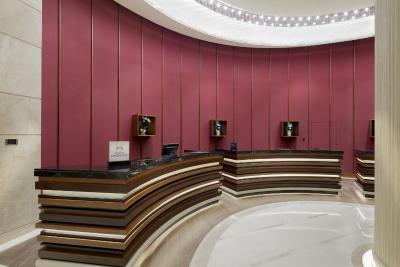 On-site library and daily complimentary newspaper can be enjoyed at Hilton Batumi. 24-hour front desk with staff speaking English, Russian, German, French, Serbian and Turkish languages will welcome and assist guests. Bicycle rental can be arranged at the hotel. Ali and Nino Statue is less than 1.2 mi from the property. Batumi International Airport is 4.3 mi away. Airport transfers are available at an additional charge. 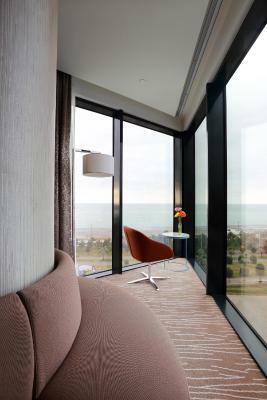 When would you like to stay at Hilton Batumi? 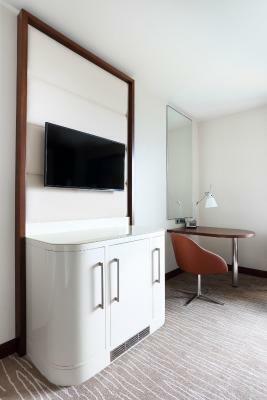 This king room offers walk-in rain shower, bathtub, 37-inch HDTV, WiFi and king size bed. King Guest Room comes with a stunning view of the city and the lake. Guests will enjoy a good night sleep in the King-sized Hilton Serenity Bed and refresh in the spacious bathroom with a separate bathtub and a walk-in rain shower. 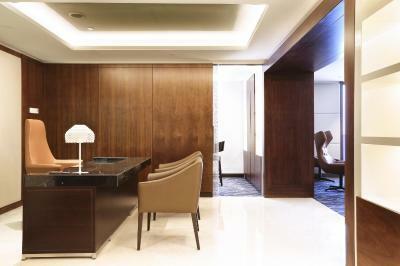 Guests will work comfortably at the desk with an ergonomic chair. They will stay connected to friends and family using in-room Wi-Fi (fees apply) or watch popular shows and movies on the 37-inch HDTV. Amenities include a safe, tea and coffee maker and individually controlled air-conditioning. Public parking is available on site (reservation is not needed) and costs GEL 15 per day. 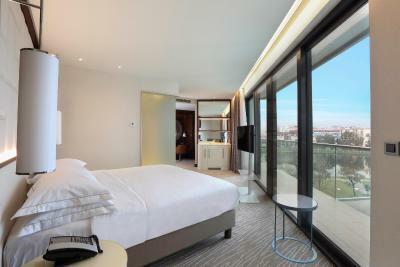 Relax in this modern 33 square yard executive room with a stunning city view. Guests enjoy a luxurious king-sized Hilton Serenity Bed and large bathroom with a separate bathtub and walk-in rain shower. This room includes exclusive access to the Executive Lounge, where guests can enjoy a delicious continental breakfast, all-day refreshments and evening canapés. Complimentary in room bottled of water , slippers and bathrobe. Work comfortably at the work desk with an ergonomic chair, connect to in-room Wi-Fi (fees apply) or watch satellite channels on the 37-inch HDTV. Amenities include a safe and tea/ coffee maker. This room includes exclusive access to the Executive Lounge, where guests can enjoy a delicious continental breakfast, all-day refreshments and evening canapés. 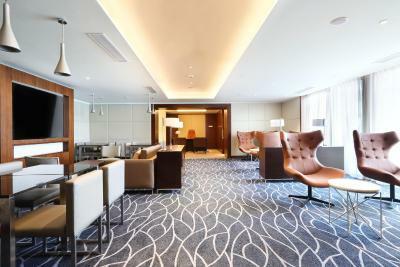 Work comfortably at the work desk with an ergonomic chair, connect to in-room Wi-Fi (fees apply) or watch satellite channels on the 37-inch HDTV. Amenities include a safe and tea/coffee maker. Indulge in this oversize 74 square yards suite and enjoy a spectacular mountain view. 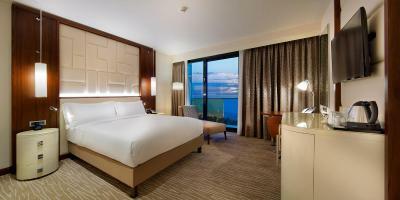 This suite provides luxurious comfort and style with a king-sized Hilton Serenity Bed. The living room features a corner sofa, dining area, hideaway library and 46-inch HDTV. 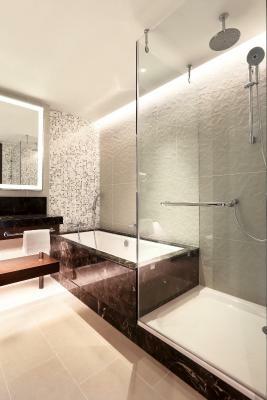 Prepare for the day in the elegant bathroom with a stand-alone bathtub and walk-in rain shower. This room includes access to the Executive Lounge, where guest enjoy a delicious continental breakfast, all-day refreshments and evening canapés. Amenities include Wi-Fi (fees apply), a safe and tea/coffee maker. 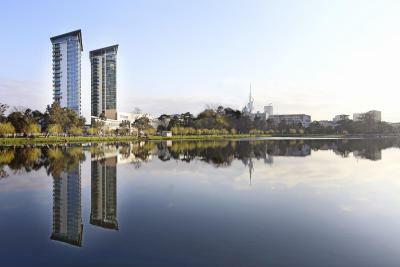 Relax in this modern 33 squre yard Twin Guest Room with a stunning view of the city or lake. Get a good night sleep on Hilton Serenity Beds and refresh in the spacious bathroom with a separate bathtub and a walk-in rain shower. Work comfortably at the desk with an ergonomic chair. Stay connected to friends and family using in-room Wi-Fi (fees apply) or watch popular shows and movies on the 37-inch HDTV. Amenities include a safe, tea/coffee maker and individually controlled air-conditioning. Room can accommodate 3 adults. This room has lounge access, walk-in rain shower, 37-inch HDTV, WiFi and twin bed. Bottle of water, slippers and bathrobe are also offered. Relax in this modern 33 square yard executive room with a stunning city view. Guests enjoy a luxurious twin-size Hilton Serenity Beds and large bathroom with a separate bathtub and walk-in rain shower. Work comfortably at the work desk with an ergonomic chair, connect to in-room Wi-Fi (fees apply) or watch satellite channels on the 37-inch HDTV. Amenities include a safe and tea/coffee maker. This room includes exclusive access to the Executive Lounge, where guests can enjoy a delicious continental breakfast, all-day refreshments and evening canapés. This room has walk-in rain shower, bathtub, 37-inch HDTV, WiFi and twin beds. Relax in this modern 33 square yard King Guest Room with a stunning view of the sea . Get a good night sleep in the King-sized Hilton Serenity Bed and refresh in the spacious bathroom with a walk-in rain shower. Work comfortably at the desk with an ergonomic chair. Stay connected to friends and family using in-room WiFi (fees apply) or watch popular shows and movies on the 37-inch HDTV. Amenities include a safe, tea and coffee maker and individually controlled air-conditioning. Room is fully equipped for people with special needs. This room comes with mountain and Sea view, big balcony, separate work area and extra space. Spread out in this 40 square yard executive room and enjoy a spectacular mountain view and sea view from the private balcony. 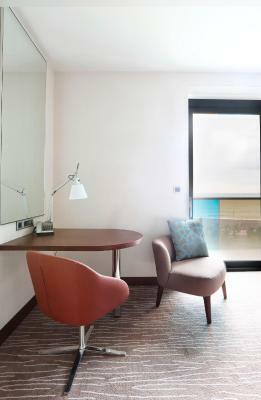 This room features a separate work area with an ergonomic chair and in-room Wi-Fi (fees apply). 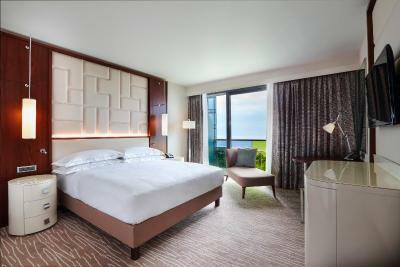 Settle in and enjoy a restful night sleep on the king-sized Hilton Serenity Bed. 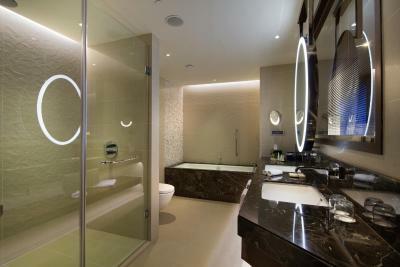 The calming bathroom features a walk-in rain shower and luxury amenities. Relax and watch satellite channels on the 37-inch HDTV. Amenities include a safe and tea/coffee maker. This room has lounge access, walk-in rain shower, 37-inch HDTV, WiFi and twin size beds. Bottle of water, slippers and bathrobe are also offered. Relax in this modern 33 square yard executive room with a stunning city view. Guests enjoy a luxurious twin-sized Hilton Serenity Beds and large bathroom with a separate bathtub and walk-in rain shower. This room has view, balcony, walk-in rain shower, bathtub, 37-inch HDTV, WiFi and twin-size beds. Relax in this modern 33 square yard Twin Guest Room with a stunning view of the sea. All of these rooms feature a balcony. Get a good night sleep in the 2 twin-sized Hilton Serenity Beds and refresh in the spacious bathroom with a separate bathtub and a walk-in rain shower. This room offers view, balcony, walk-in rain shower, bathtub, 37-inch HDTV, WiFi and king-size bed. Relax in this modern 33 square yard King Guest Room with a stunning view of the city or lake. All rooms in this category feature a balcony. Get a good night sleep in the king-sized Hilton Serenity Beds and refresh in the spacious bathroom with a separate bathtub and a walk-in rain shower. This room has lounge access, view, balcony, walk-in rain shower, 37-inch HDTV, WiFi and twin size beds. Bottle of water, slippers and bathrobe are also offered. 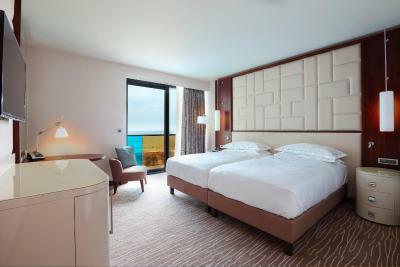 Relax in this modern 33 square yard executive room with a stunning sea view. All room in this category feature a balcony. Guests enjoy a luxurious twin-size Hilton Serenity Bed and large bathroom with a separate bathtub and walk-in rain shower. This room includes exclusive access to the Executive Lounge, where guests can enjoy a delicious continental breakfast, all-day refreshments and evening canapés. 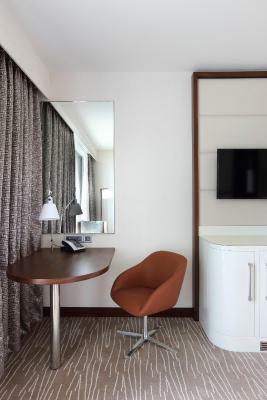 Work comfortably at the work desk with an ergonomic chair, connect to in-room WiFi (fees apply) or watch satellite channels on the 37-inch HDTV. Amenities include a safe and tea/coffee maker. 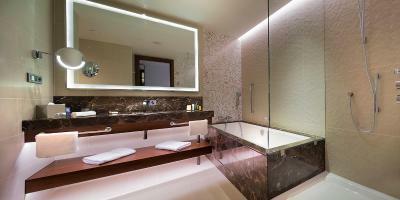 this room offers balcony, walk-in rain shower, bathtub, 37-inch HDTV, WiFi and twin-sized beds. Relax in this modern 33 square yard Twin Guest Room with a stunning view of the city or the lake. All of these rooms feature a balcony. Get a good night sleep in the 2 twin-sized Hilton Serenity Beds and refresh in the spacious bathroom with a separate bathtub and a walk-in rain shower. Work comfortably at the desk with an ergonomic chair. Stay connected to friends and family using in-room WiFi (fees apply) or watch popular shows and movies on the 37-inch HDTV. Amenities include a safe, tea/coffee maker and individually controlled air-conditioning. Room can accommodate 3 people. This room has lounge access, view, balcony, walk-in rain shower, 37-inch HDTV, WiFi and king-sized bed. Bottle of water, slippers and bathrobe are also offered. Relax in this modern 33 square yard executive room with a stunning sea view. All of these rooms feature a balcony. Guests enjoy a luxurious king-sized Hilton Serenity Bed and large bathroom with a separate bathtub and walk-in rain shower. 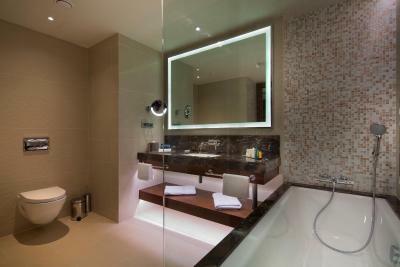 This room comes with view, balcony, walk-in rain shower, bathtub, 37-inch HDTV, WiFi and king-sized bed. Relax in this modern 33 square yard King Guest Room with a stunning view over the sea. All of these rooms feature a balcony. Get a good night sleep in the king-sized Hilton Serenity Bed and refresh in the spacious bathroom with a separate bathtub and a walk-in rain shower. This room offers extra space, separate working area and sea view. Bottle of water, slippers and bathrobe are also offered. 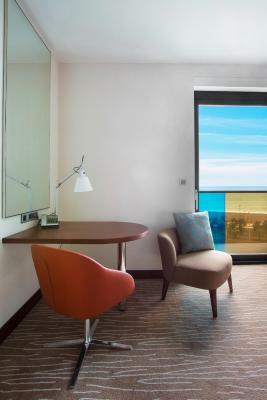 Choose this 49 square mentre executive room for a stunning sea, mountain or city view and plenty of space. This room provides comfort and style with modern décor and a chaise lounge. 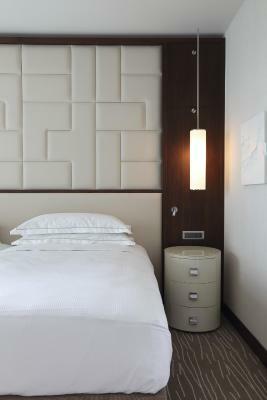 Settle in for a restful night sleep in the king-sized Hilton Serenity Bed. 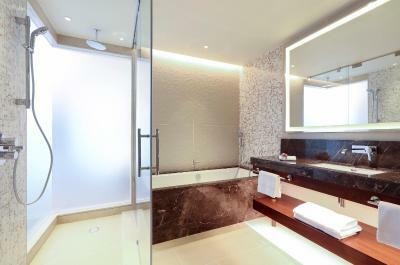 Prepare for the day in front of a seascape view in the bathroom with a walk-in rain shower and separate bathtub. Relax and watch satellite channels on the 37-inch HDTV. This room features a separate working area for extra privacy and a wardrobe for storing your attire. This room includes access to the Executive Lounge, where guests enjoy a delicious continental breakfast, all-day refreshments and evening canapés. Amenities include WiFi (fees apply), a safe and tea/coffee maker. Spend an unforgettable time at the Black Sea coast. 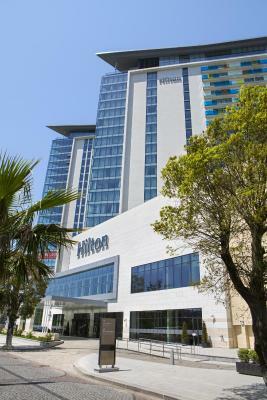 Visit Hilton Batumi and enjoy the luxurious hotel and the most welcoming team in the city. One of the few hotels in the city with balconies, Hilton Batumi is the perfect location for a business trip as well as a quality time with your loved ones. 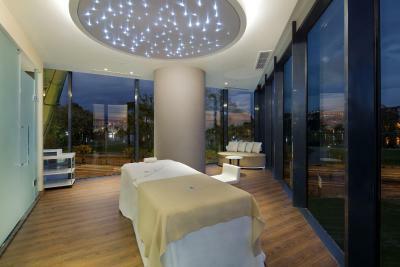 Enjoy the contemporary comfortable rooms, unique eforea Spa and the Nephele Sky Bar to make most of your stay. 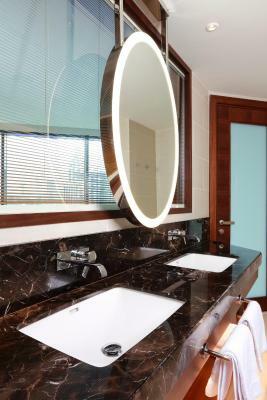 House Rules Hilton Batumi takes special requests – add in the next step! 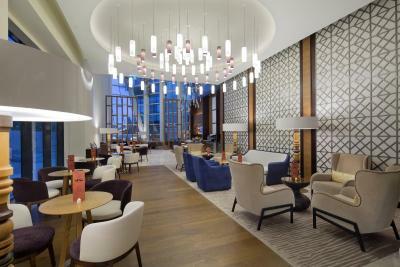 Hilton Batumi accepts these cards and reserves the right to temporarily hold an amount prior to arrival. 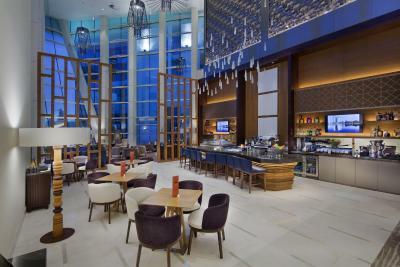 Please note that free WiFi throughout the hotel is available for HHonors members. For all prepaid bookings, guests are kindly asked to present their passport and a bank card used for booking upon check-in. There were no bathrobes, slippers. bathroom. Water was going out of the cabin and accumulating on the floor of the bathroom all the time whenever we were taking a shower. No slippers, spring water and brush tools in the room. The receptation staff is very nice. They have to manage the payments cuz I had dollars on me and they didn’t accept it and the didn’t take the money from my account so they take 3 hundred dollars and keep it with them as a deposit until I go and change another 300 dollars to get my deposit back , ridiculous ! Conection to wifi is too complicated. Registration window was not poping up. first hotel I've stayed in which charges for drinking water. I complained at the front desk, was told they are looking into the matter and need "managment approval " to provide free drinking water. Improved access to the seafront. Very good breakfast and friendly staff. Reasonable location and very clean. Good facilities and a fine restaurant with some entertainment. Bill was settled quickly and efficiently and a taxi on hand for the airport connection.